ところで、これ、Dropbox の LAN同期 (LAN sync) 機能は持っているのだろうか? Bus 002 Device 002: ID 1005:b155 Apacer Technology, Inc.
< #     name            "My OSS Device"
< #     name            "My HTTP Stream"
>         /bin/echo "Run Optware/ipkg /opt/etc/init.d/*"
>         # executing them in numerical order. >           # Ignore dangling symlinks (if any). >                 # Source shell script for speed. >                 # No sh extension, so fork subprocess. /dev/md9: 517.63MiB raid1 2 devices, 0 spares. Use mdadm --detail for more detail. /dev/md0: 1861.52GiB raid1 2 devices, 0 spares. Use mdadm --detail for more detail. 2089 Information 2012/6/17 17:59:24 System 127.0.0.1 localhost System started. 2088 Information 2012/6/17 17:56:37 System 127.0.0.1 localhost System was shut down on Sun Jun 17 17:56:37 JST 2012. 2087 Information 2012/6/17 17:55:17 admin 192.168.1.39 --- [Power Management] System will be restart now. 2086 Information 2012/6/17 17:46:14 System 127.0.0.1 localhost System updated successfully from 3.6.1 to 3.7.1. 2085 Information 2012/6/17 17:42:29 System 127.0.0.1 localhost [Firmware Upgrade] Start to update the firmware. 2084 Information 2012/6/17 17:38:10 System 127.0.0.1 localhost SambaFix 1.0.0 installation succeeded. 2083 Information 2012/6/17 17:38:04 System 127.0.0.1 localhost System started. 920 Information 2012/6/17 18:11:48 System 127.0.0.1 localhost System started. 919 Information 2012/6/17 18:09:33 System 127.0.0.1 localhost System was shut down on Sun Jun 17 18:09:33 JST 2012. 918 Information 2012/6/17 18:08:22 System 127.0.0.1 localhost System updated successfully from 3.6.1 to 3.7.1. 917 Information 2012/6/17 18:06:01 System 127.0.0.1 localhost [Firmware Upgrade] Start to update the firmware. 916 Information 2012/6/17 10:01:04 System 127.0.0.1 localhost [HDD SMART] HDD 2 Rapid Test result: Completed without error. 1819	Information	2012/5/26	20:57:30	System	127.0.0.1	localhost	SambaFix 1.0.0 installation succeeded. 804	Information	2012/5/26	21:09:05	System	127.0.0.1	localhost	SambaFix 1.0.0 installation succeeded. iperf - 2.0.4-1 - A tool for measuring TCP and UDP bandwidth performance. Description: A tool for measuring TCP and UDP bandwidth performance. $ ssh admin@QNAPのIPアドレス "/sbin/set_volume_mode Dropbox"
-h, Display this help and exit. -h, --help              Display this help and exit. Couldn't locate your Dropbox folder. Did you move it somewhere? Please visit https://www.dropbox.com/cli_link?XXXXXXXXXXXXXXXX to link this machine. This client is not linked to any account.. Client successfully linked, Welcome xxxxxxx! Cannot find termcap entry for 'vt100'. +  /bin/echo "Run Optware/ipkg /opt/etc/init.d/*"
+       # executing them in numerical order. +           # Ignore dangling symlinks (if any). +                   # Source shell script for speed. +                   # No sh extension, so fork subprocess. 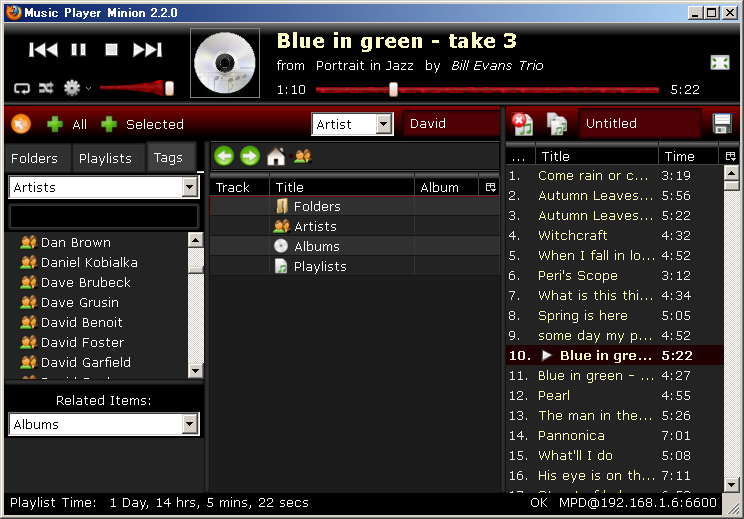 lame - 3.98.4-1 - LAME is an LGPL MP3 encoder. mp3info - 0.8.5a-1 - A little utility used to read and modify the ID3 tags of MP3 files. d to use the Tremor integer decoder. libvorbis - 1.3.2-1 - Ogg Vorbis compressed audio format. vorbis-tools - 1.1.1-5 - A set of tools to manipulate ogg-vorbis files. curses interface in playmp3list style. ncmpc - 0.16.1-1 - A curses client for the Music Player Daemon (MPD). libmpcdec - 1.2.6-1 - Portable Musepack decoder library. mpc - 0.19-1 - A command line tool to interface MPD. mpdscribble - 0.19-1 - Last.fm reporting client for mpd. 8 Bit Weapon & ComputeHer - Chiptopia! postfix - 2.3.19-1 - The Postfix mail system is an alternative to sendmail. postfix-doc - 2.3.19-1 - The Postfix mail system is an alternative to sendmail. mpop - 1.0.24-1 - mpop is an SMTP client. nginx - 1.0.5-1 - A high perfomance http and reverse proxy server, and IMAP/POP3 proxy server. popt - 1.16-1 - A C library for parsing command line parameters. poptop - 1.2.1-1 - Poptop is the PPTP server solution for Linux. xmail - 1.25-4 - A combined easy to configure SMTP, POP3 and Finger server. procmail - 3.22-4 - Versatile email processor. abook - 0.5.6-2 - Abook is a text-based addressbook program designed to use with mutt mail client. mailman - 2.1.11-1 - the GNU Mailing List Manager. perl-email-address - 1.889-1 - RFC 2822 Address Parsing and Creation. perl-email-messageid - 1.401-1 - Generate world unique message-ids. perl-email-mime - 1.863-3 - Easy MIME message parsing. perl-email-mime-contenttype - 1.015-1 - Parse a MIME Content-Type Header. perl-email-mime-encodings - 1.312-1 - A unified interface to MIME encodings and decoding. perl-email-send - 2.194-2 - Simply Sending Email. perl-email-simple - 2.005-1 - simple parsing of RFC2822 message format and headers. py-roundup-common - 1.4.16-1 - An issue-tracking system with command-line, web and e-mail interfaces. py25-roundup - 1.4.16-1 - An issue-tracking system with command-line, web and e-mail interfaces. py26-roundup - 1.4.16-1 - An issue-tracking system with command-line, web and e-mail interfaces. sendmail - 8.14.2-1 - The most classic SMTP server. nget - 0.27.1-4 - nget is a command line nntp file grabber. # hg ci -m "ntp"
/bin/echo -n -e "Content-type: text/plain; charset=iso-8859-1\n\n"
/bin/echo "send wakeaup packet: MAC=$MAC"